Published by Pauline Pontois 15 October, 2018 in Trade and industry group. On October 11th, for the first time during the High School Days (Gymnasiedagarna) and Future Skills, a parent meeting was held in Arabic. The Trade and Industry Group that works with inclusion supported this pilot initiative. During three full days, 9th to 11th of October, more than 33 000 visitors gathered at the High School Days (Gymnasiedagarna) and Future Skills at the Swedish Exhibition and Congress Centre. This is an annual information and guidance fair organized by the region of Gothenburg, and the main meeting place for future high school students, education organizers and representatives of working. In addition to lectures and activities, five information meetings for parents were held, among which one in Arabic. 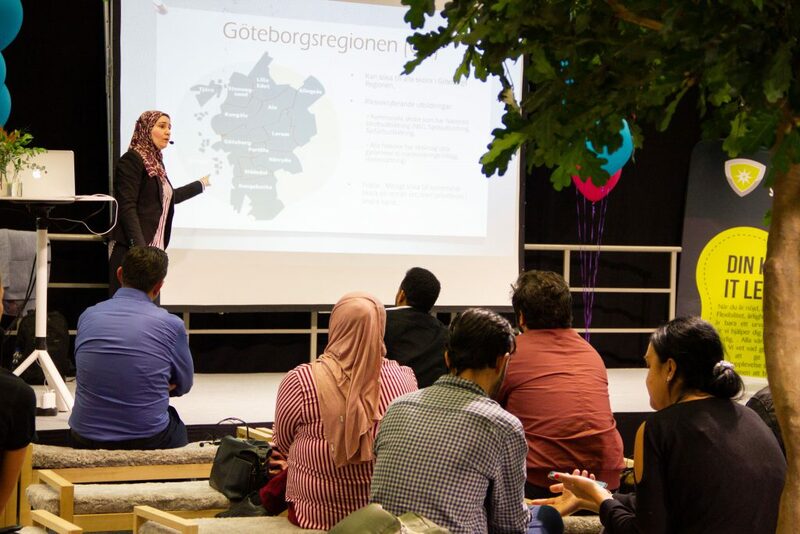 On the 11th of October, participants gathered around the Swedish Exhibition and Congress Centre’s main stage for more information about various school programs in the region of Gothenburg as well as a picture of the Swedish labor market, all in Arabic. Many questions were asked to the speakers Mohammed Megdad from the Swedish Public Employment Service and Maha Hannouneh, Student Supervisor from Mölndal City. This initiative aims to reach an important target group that has not previously taken part in the High School Day because of the language barrier. Other activities were also organized on this same day, mostly for adult sfi-students and newly arrived in Sweden. In addition, anyone who needed a language support could get help from a guide during their visit. “Such meetings are important,” says Bouchra Hamdi. She attends the fair with the sfi-student Ahmed Alaa. “I was interested in the presentation of the Swedish Public Employment Service and I am very pleased with the information I received. I think more meetings should be arranged in Arabic.” She adds. Tagged with Future Skills, Gymnasiedagarna.